Changes in latitudes – changes in attitudes. I changed my walking direction today and it made all the difference in the world. After yesterday’s headgear debacle, I opted for a knitted number that I’ve owned for eons. It is an Italian nubby texture, open-weave, knit beret which I bought to match a beige-colored storm coat many years ago. I liked it as I could tuck my long hair underneath and keep it dry while commuting back and forth to work on the bus. I decided this morning to put that hat back into commission. I’ll admit it is a rather putrid color … gold and cornflower blue. The first time I wore it someone on the bus remarked that it looked like something a Smurfette would wear. Trying to hide my irritation with her comment (and because I had never heard of the word “Smurfette”), I raised my eyebrows slightly in a quizzical manner, then inquired politely what a Smurfette was. There was no Google back in those days. It was suggested I should watch the Saturday morning cartoon called “The Smurfs” … I took a peek, then I “got it”. I was checking the furnace filter before I left since we are having another Polar Vortex episode later in the week, and the furnace will be cranked up to full capacity. I heard the wind whistling and howling outside while I was in the furnace room. Should I just stay inside … or venture out? I opted for the latter as it was the weekend and I had more time, so off I went at 9:00 a.m., camera in tow and pockets full of critter treats left over from yesterday’s fateful trip. I glanced at Marge’s big deck thermometer and noted that the needle pointed to 25 degrees, but I sure felt that stiff wind and pulled my scarf up higher on my neck. 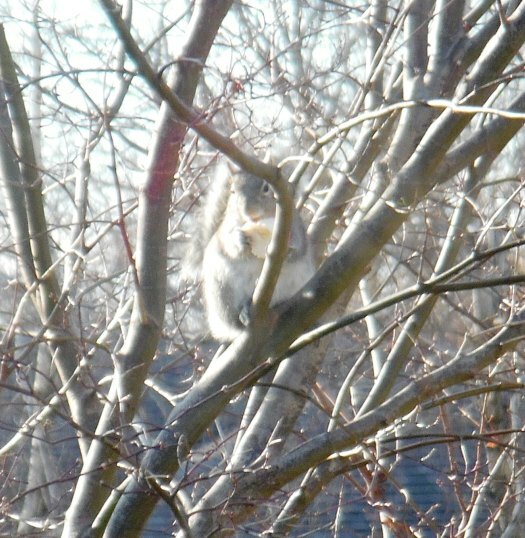 One of Marge’s big fat backyard squirrels, with an insatiable appetite, had positioned himself in the nearby tree while chomping on some baked goods. He had one eye trained on the door wall as he patiently waited on a hand to emerge full of his primo treat – peanuts. It was murky looking out and the sensor light was still on. I hesitated after stepping outside – there was just a trace of snow on the sidewalk, but that dusting covered up any icy patches. I figured I’d just walk in the street as it was safer than wondering if there was black ice underneath the snow. The sidewalks, trees and bushes looked like Mother Nature took her sifter and lightly dusted them with icing sugar – in fact, it looked rather pretty. As I dodged the potholes and craters in the street, the pavement looked like Frosted Flakes – bumpy and sugar-coated. While I meandered through the neighborhoods, still walking in the street, a car came zipping down the middle of Pagel, just a mite too fast for my liking and so I gave it wide berth. I didn’t see anyone behind the wheel at first, until the car got right alongside me, then I noticed a very short, white-haired, little old lady driving that big Buick. She had a death-grip on the steering wheel and was hunched over it. I had to snicker … not to disparage her, but instead because she reminded me of myself. I despise driving in the Winter, having taken the bus for over three decades while my little buggy sat ensconced from the elements in the warm garage. But she looked my way and gave me a big wave (while inwardly I cringed, thinking to myself ‘keep those hands at 10:00 o’clock and 2:00 o’clock please’), and soon she was past me. My feet were on autopilot to Council Point Park, and, by walking in the street it took me a little longer than usual, but I made it there in one piece. The parking lot wasn’t shoveled and neither was the perimeter path, but I was close to my intended destination – the Park’s gateway to the walking path, because I wanted to get a Winter picture to complete my four-season collage of that particular spot. Before I could reach that destination, however, I heard chattering and a clicking noise up in the tree and saw a squirrel peering down from his nest. I wondered if he recognized me and I dug into my pocket and dragged out the bag of peanuts and wiggled the hard plastic bag for him to see and hear what I had for him. Well, that lazy bones seemed content to just look down at me from his hidey hole high up in the tree. He knew I’d make a “dropping” for him and maybe he wasn’t in the mood to get his feet cold and wet, or perhaps he was snugglin’ with the missus. No problem Mr. Squirrel. I accommodated him, spread some peanuts at the base of the tree, then moved on to get my intended shot. I positioned myself where the two forks meet at the entrance to the perimeter path and took a few pictures. Great. But, then I zoomed in to take a third shot and the camera lens closed and shut itself off. Irritated, I turned it back on and the “Change batteries! !” message was in the screen. Nice timing. I got enough shots anyway. the squirrel could’ve showed a sign of life … less disinterest next time please. But, we are, after all, dealing with Nature, so life is about as good as it gets on a cold and dreary January day. I trudged home and added another three miles to my tally. 4 Responses to Changes in latitudes – changes in attitudes. Well you were a brave one today. I don’t see much activity on my deck. It is cold and even animals don’t venture out to far. I’m glad you did get out, tomorrow will be much colder. I heard that – I didn’t intend to go out tomorrow morning but may have to go to run the car – not sure. Supposed to be a Polar Vortex end of the week … hope you have a few good books to read. Oh I have about 100 books collected from garage sales this summer but since we didn’t get the snow like we had last winter I will have a lot of them left for next winter.